A new Egyptian restaurant on Hau Wo Street, with great food, reasonable prices and ever-so-friendly staff, Aziza is the perfect opening following the recent closure of Hollywood Road’s fab Egyptian eatery, The Nile. Aziza’s a small, family-run joint with hand painted murals and the menu includes all the expected Middle Eastern and North African favourites. We begin by ordering hummus ($19), zabadi ($28) and babaganoush ($38), all of which come with a generous serving of pitta bread. The hummus is some of the freshest and best we’ve had in a long time, with a healthy dose of garlic satisfying our taste buds. The babaganoush lacks a little smokiness but it’s still a good ’un. We dip our vine leaf rice wraps into the zabadi – a yoghurt dip with cucumber, garlic, mint and olive oil – and it’s a match made in heaven, the creaminess of the dip mellowing the aromatic rice. 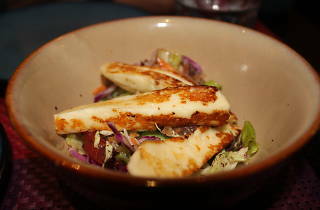 The halloumi is halloumi, in that, halloumi is almost always good. What we really appreciate is the expert charring that brings out the full buttery, salty flavour of the cheese without making it too rubbery. 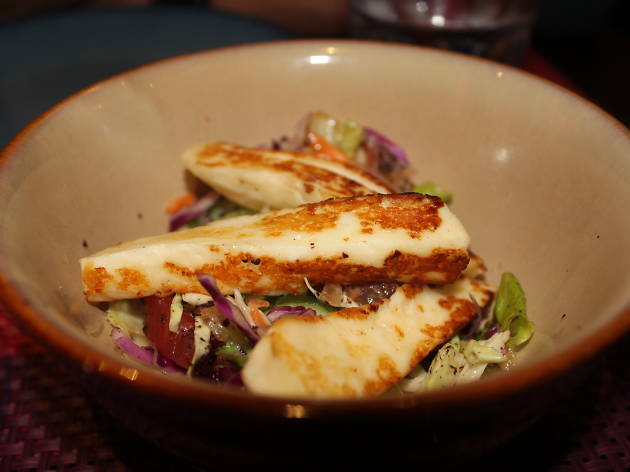 The starters get a thumbs up all round from wallets and stomachs alike. 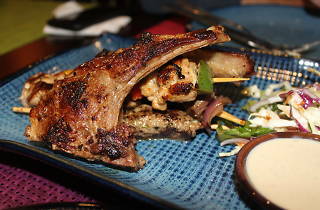 Moving on, we order a mixed grill of lamb kofta, cubed beef skewers and chicken thigh with a side of fluffy couscous ($180). Though all the meats are tasty, the beef and chicken are a tad tough. The kofta are definitely the winners here. 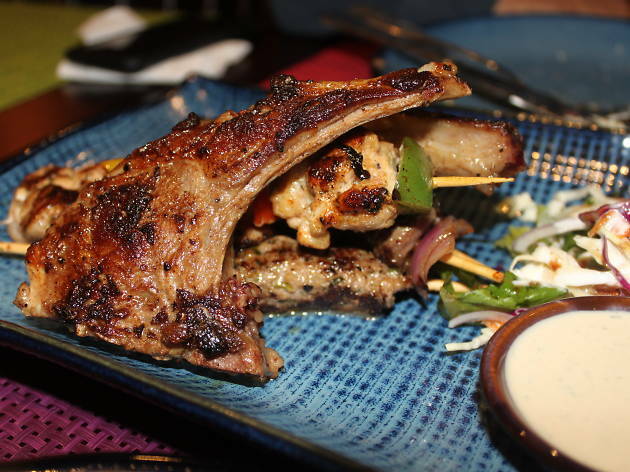 Perfectly seasoned with a medley of fresh herbs, the lamb is juicy and crumbly, as any good kofta should be. Although stuffed, our curiosity regarding the kar assaly ($42) – Egyptian-style baked pumpkin pie – gets the better of us, so we ask for a serving. The dessert isn’t too sweet and comes topped with baked egg custard, similar to that of a Portuguese egg tart, with warm, tasty, slightly spiced pumpkin underneath. All in all, Aziza a very welcome addition to the slowly-blossoming array of modern eateries in K-Town. We’ll be back. This family owned resto is one of my favorite in KTown. Try their homemade couscous. Everything is fresh and incredibly flavorful. Get there early. Small space but grab a beer across the street at 7-11 if you have to wait. You can chill with some of the family outside.